Did you know.. Jeans first came about in 1873? When the tailor Jacob Davis had a customer order for a sturdy pair of trousers that could withstand hard work he used some of the denim he bought from Levi Strauss & Co. Davis then made them stronger by placing copper rivets at the pockets and fly, and in turn wanted to patent them. He then became partners with Strauss, opened a business - and so the Jeans were born! Since then, jeans have taken a turn from being worn for working clothing - to becoming a fashion statement and a must have in every girl and guy’s wardrobe’s. We see designers reinterpret womens jeans often, styles change regularly, and current trends can impact the look of these denims. 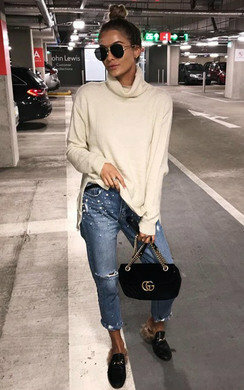 Styles such as the MOM jeans, skinny jeans, bootcut jeans and straight leg jeans are all styles of womens jeans loved by the nation. We cannot get enough! Here at IKRUSH, we have just dropped some new denim dreams that you are going to LOVE! You need to check out some of our embellished jeans with pearls and beads that are to die for! We have styles such as Clarisa, Jesse and Naila that are super fun and the cuestest womens jeans for this spring season! Super skinny and super girly, these pretty pink jeans are perfect for a cute and flirty style. Our styles Polly and Rosilee are a pastel pink dream, and the perfect womens jeans for pairing with a crop top and sandals for a chic vibe. To add a lil bit of sporty spice in your life, these striped skinnies are effortless and fun! Our style Lottie is available in 3 variations and are perfectly paired with some killer heels to look fierce or trainers for a laid back style. These faded style skinnies are like looking into the night sky - sparkles make everything better. Our Maisie womens jeans come in 2 colours of denim and the diamante detailing make them fun and flirty. Be sure to tag us in your fave womens jeans on insta using #ikrushbabe - we love to see you styling our picks!